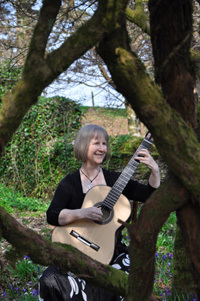 Catherine Thom is Ireland's renowned classical guitarist. She has performed nationally and internationally, including twice at London's Wigmore Hall, and has given over fifty television and radio broadcasts. children, the homeless, handicapped, and terminally ill; some under the auspices of Yehudi Menhuin's 'Live Music Now'. Catherine's extensive concert career has brought many memorable moments, such as being transported to a concert by tractor on the island of Sark (where there are no cars), explaining the Quantum Theory in words and music with a renowned physicist, and being given afternoon tea by murderers and drug dealers before a concert in Maidstone Prison. Catherine's Irish blend of humour and dignity has warmed many audiences.